For twenty years, Helsinki Baroque Orchestra’s performances and recordings have been captivating audiences with a potent combination of emotional eloquence and infectious vitality. Their programmes frequently include first modern performances of unpublished or reconstructed masterpieces, and also shed unexpected and often provocative new light on more familiar works. 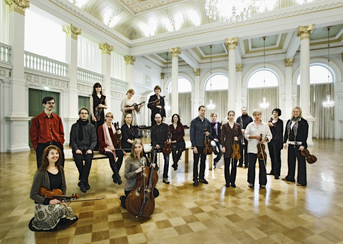 Their music-making has contributed to the ensemble’s reputation as a major exponent of Baltic and German Baroque music. At home, groundbreaking productions of Monteverdi’s and Handel’s operas have earned the orchestra wide recognition. Since 2011, Helsinki Baroque Orchestra’s monthly series at the Helsinki Musiikkitalo has reached a large, new, and enthusiastic public. A visionary selection of repertoire and guest artists has ignited the audience in an unprecedented way, and in the process catalysed early music’s elevation to something of a cult status in Finland. Recurring soloists and guest directors include Franco Fagioli, Isabelle Faust, Reinhard Goebel, Werner Güra, Erich Höbarth, René Jacobs, Sophie Karthäuser, Julia Lezhneva, Riccardo Minasi, Enrico Onofri, Valer Sabadus, Carolyn Sampson, Skip Sempé, and Dmitry Sinkovsky.